Stockholm is the capital of Sweden and is sometimes called “Venice of the North” becuase it is built on several islands. Almost every corner of the city is in proximity to water which makes it a perfect place for those pretty Instagram moments. Stockholm has a nice mix of old charm and new elegance, with medieval cobblestone streets mixed with super modern architecture. Since I have explored many areas of the city with my camera, I would like to share some of my favorite places to photograph Stockholm from its most interesting side. Here are my ten favourites among the most Instagrammable places in Stockholm. Gröna Lund is Stockholm’s amusement park, located on beautiful Djurgården. Spend a day here and enjoy the many rides, get some cotton candy and grab a bite to eat. In the evenings there are often concerts that are free to the guests. Many of the rides have stunning views of the water and the city center. 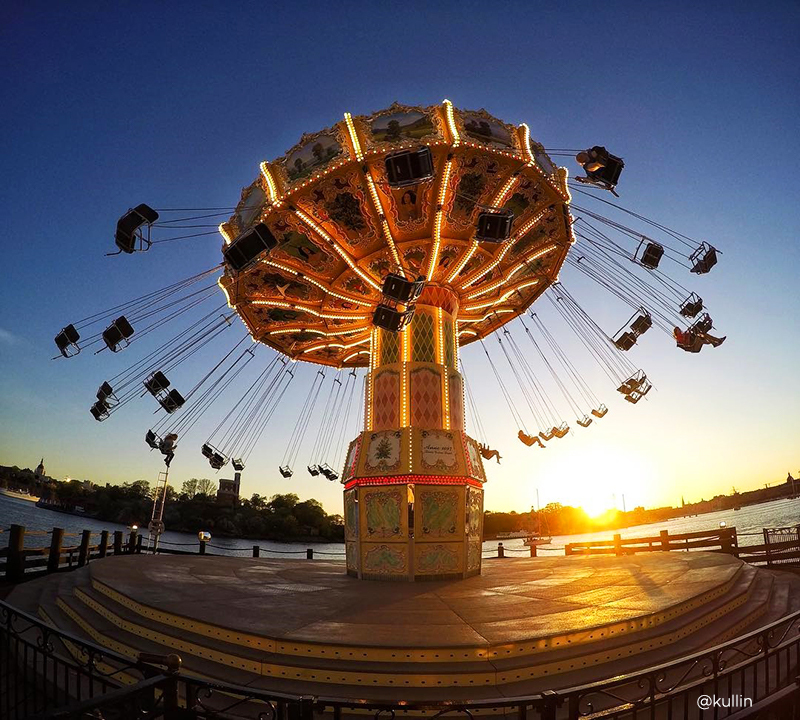 As the sun sets, go down to the water and take som photos of the old swing ride in the sunset. Then take the ferry or the tram back to the city. Mounteliusvägen (Montelius path) is located on Mariabeget, a hilly part of trendy Södermalm. 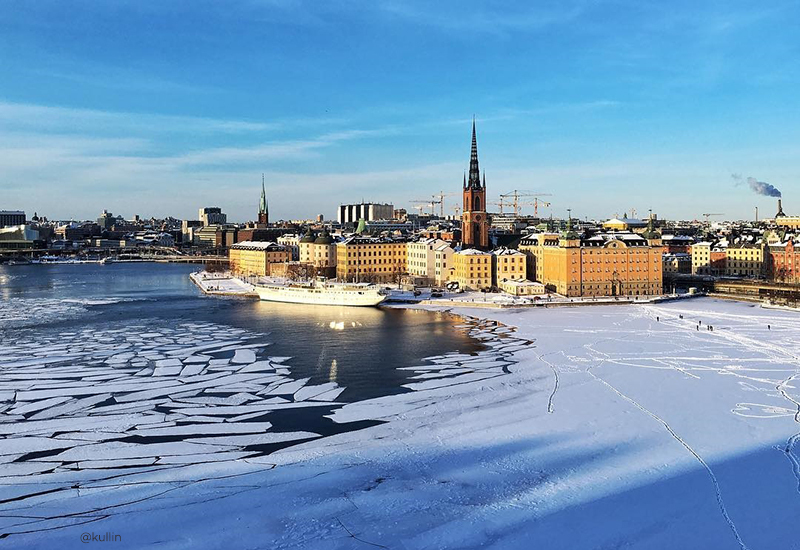 This is a 500 meter long walking path with a spectacular view of Stockholm City Hall, Kungsholmen and Riddarholmen. Some of the most iconic photos of Stockholm have been taken from this path and there are always a number of tourists taking selfies at the vantage point. The view here is especially nice at sunrise and sunset. Closest subway stations are Mariatorget and Slussen. The view of Riddarholmen as seen from Monteliusvägen. 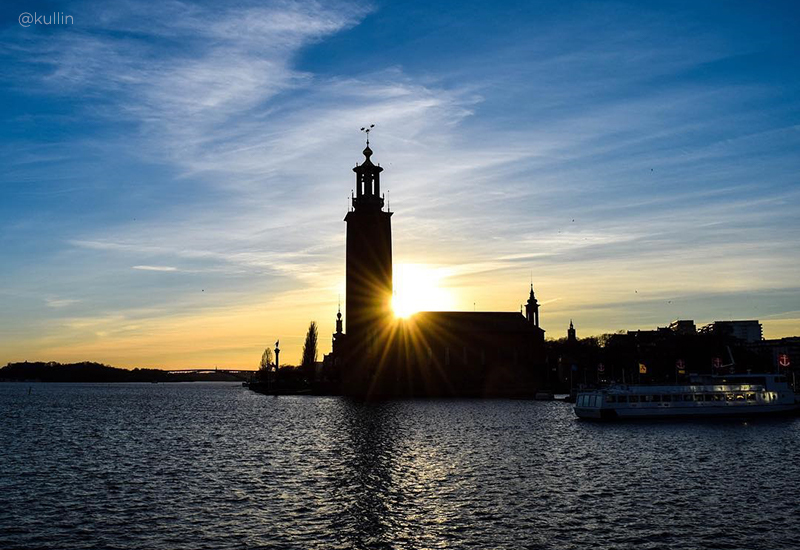 Stockholm City Hall is one of Sweden’s most famous buildings and a must see for any tourist in Stockholm. 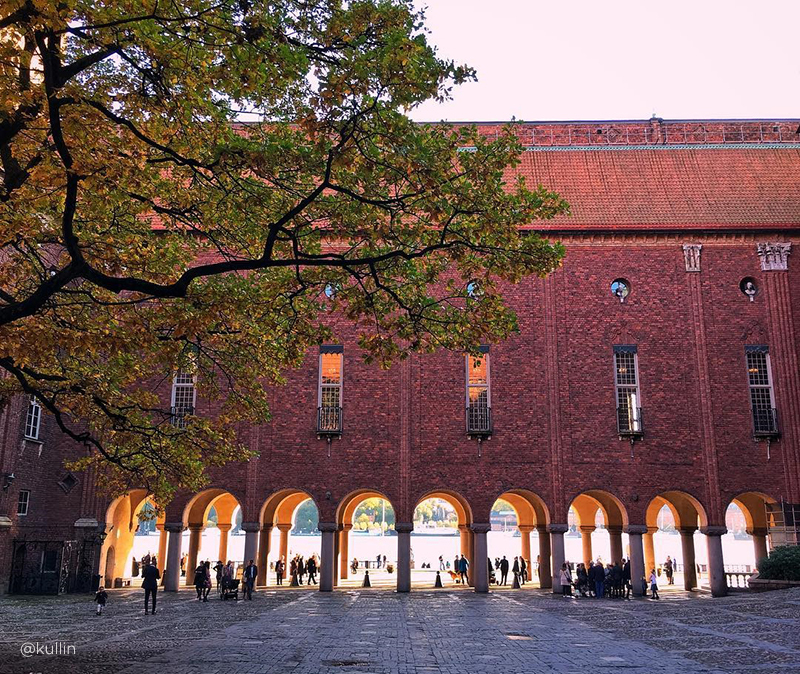 This iconic building is where the Nobel Prize banquet is held on 10th of December every year. 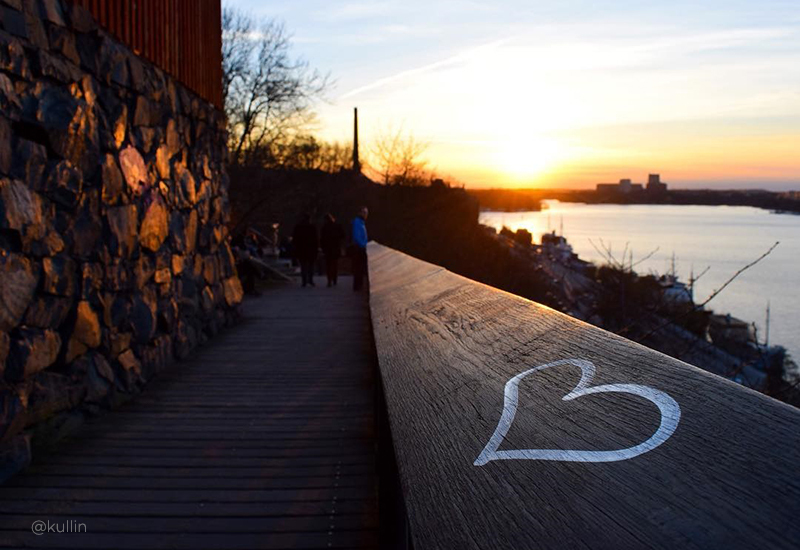 It is located on the tip of Kungsholmen, at the heart of the city and is visible from many different areas, such as Södermalm and Riddarholmen. At the center of the City Hall is a large piazza and you can snap som beautiful photos of the light shining through the arches at the southern end of the building. 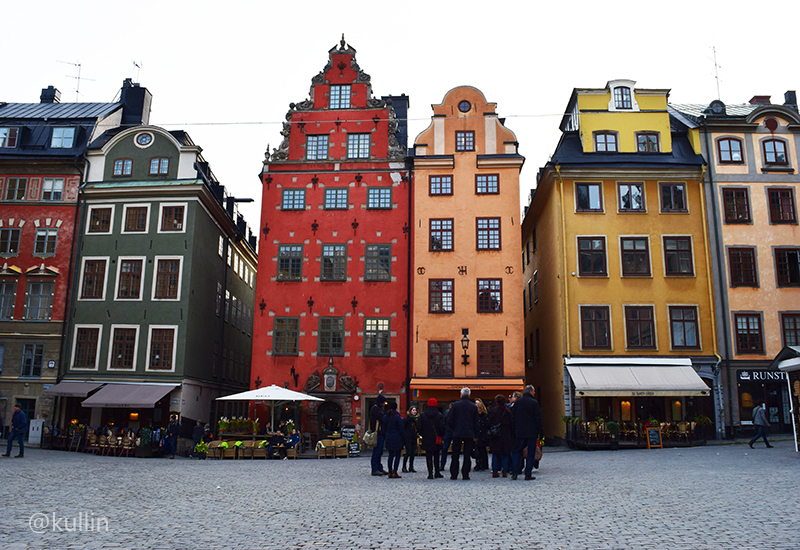 Gamla Stan, or the Old Town, is one of the largest and most well preserved medieval city centers in Europe. Here you can find the Royal Castle and a large number of cobblestone streets with old and charming buildings. A popular tourist spot is Stortorget (“the large square”) which is framed by several colourful old buildings. The photo above shows the charming restaurant Under Kastanjen (“under the chestnut tree”), but you can easily find many other photogenic spots. The old town has many narrow alleys that are perfect backdrops for that necessary travel blogger selfie. 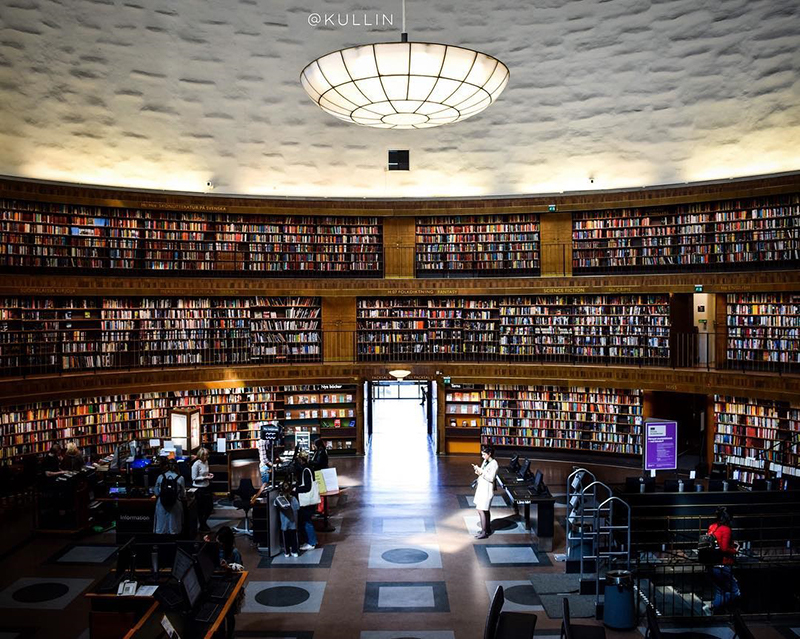 The Stockholm Public Library was designed by Swedish architect Gunnar Asplund, and is one of Stockholm’s most famous buildings. It is as beautiful from the outside as from the inside. The interior of the rotunda is impressive with several levels of book shelves that surround the visitors. 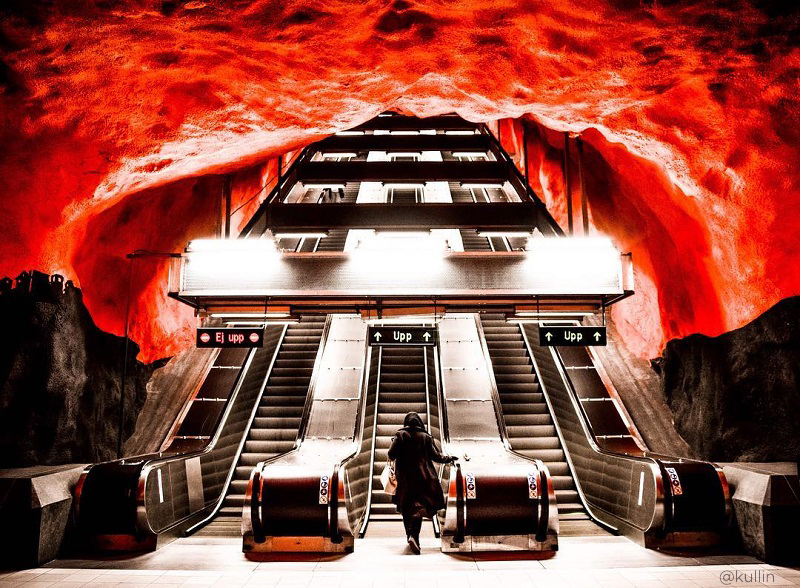 Often dubbed the world’s longest art gallery, the subway system in Stockholm is a tourist attraction of its own. More than 90 of the 100 subway stations in have been decorated in their own unique style, with paintings, sculptures and mosaics by some 150 artists. One of my favourites is the station at Solna Centrum. Technically not in Stockholm, but only a few minutes by train from the central station, this station with its red cave-like ceiling is well worth the detour. See photos from two brand new commuter train stations in Stockholm. Brunkebergs tunnel, is a shortcut for cyclists and pedestrians and it connects David Bagares gata and Tunnelgatan in the city centre. 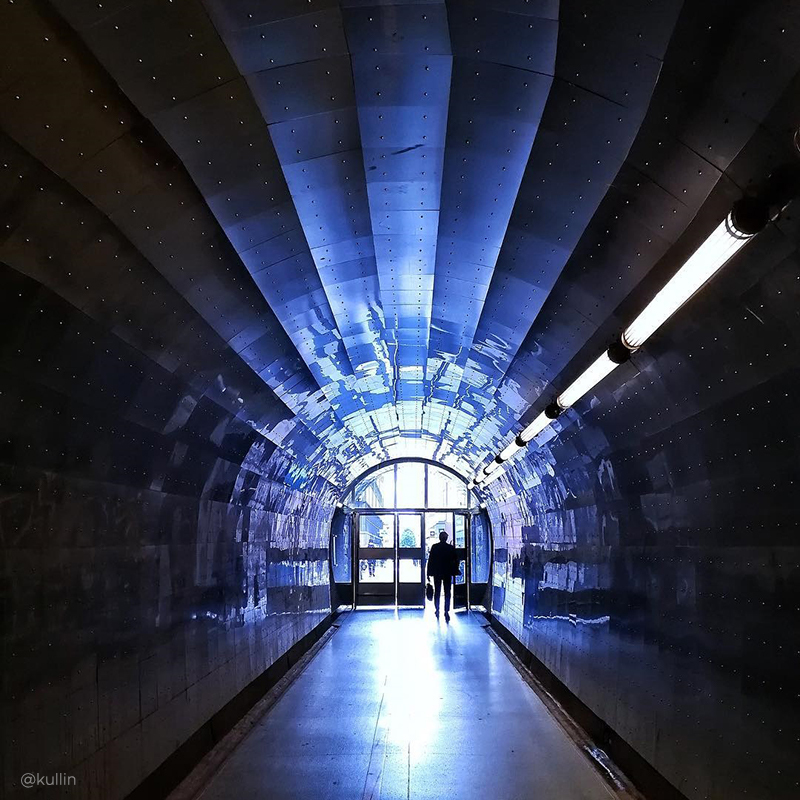 This tunnel is a favourite photo spots in Stockholm among Instagrammers. It was completed in 1886 and with its unique architecture it is a common place for photo shoots. I love the effect of the vanishing point in this 231 meter long tunnel, which also is equipped with a strange eerie sound as you walk past. Kungsträdgården is a beautiful park in Stockholm, near the shopping areas of Hamngatan, the Opera House and the Royal Castle. 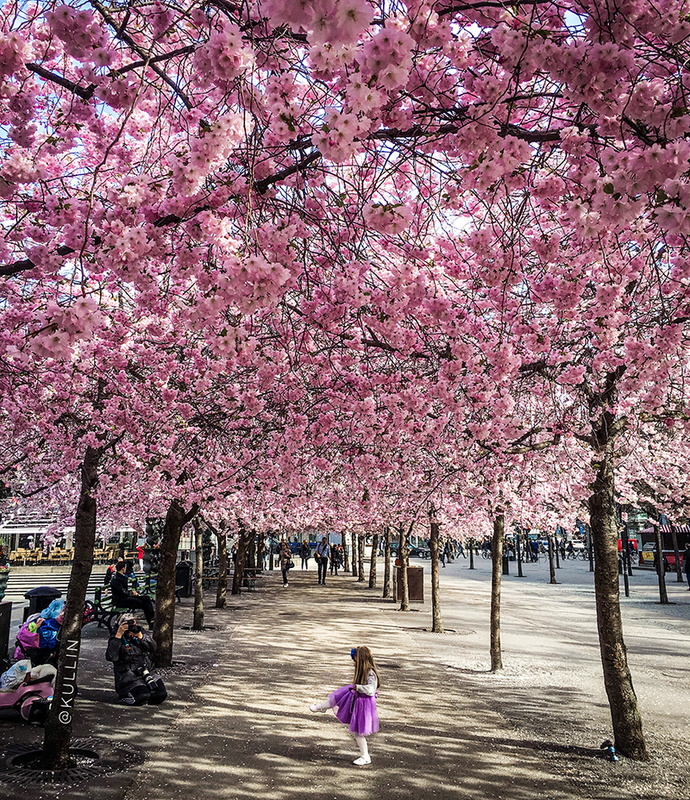 Each year in mid April to early May, the Japanese cherry blossom trees in Kungsträdgården transform the park to a pink garden. Join the crowds here for a very special photo at the height of the cherry blossom season. Pro tip: visit early in the morning and you might even have the place to yourself. Humlegården is another centrally located park in Stockholm, in the Östermalm area and close to trendy Stureplan. 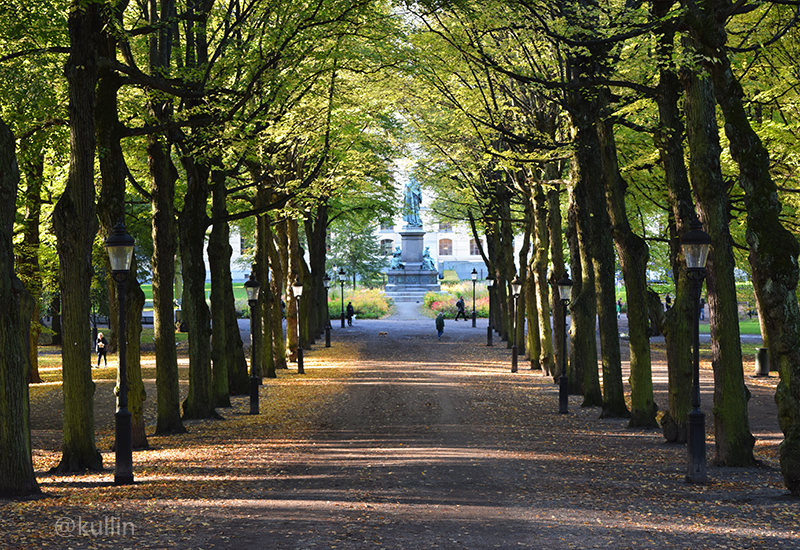 The park has several alleys and the one pictured above leads the the Royal Library. This park is especially nice in fall as the leaves fall off and colour the ground orange. 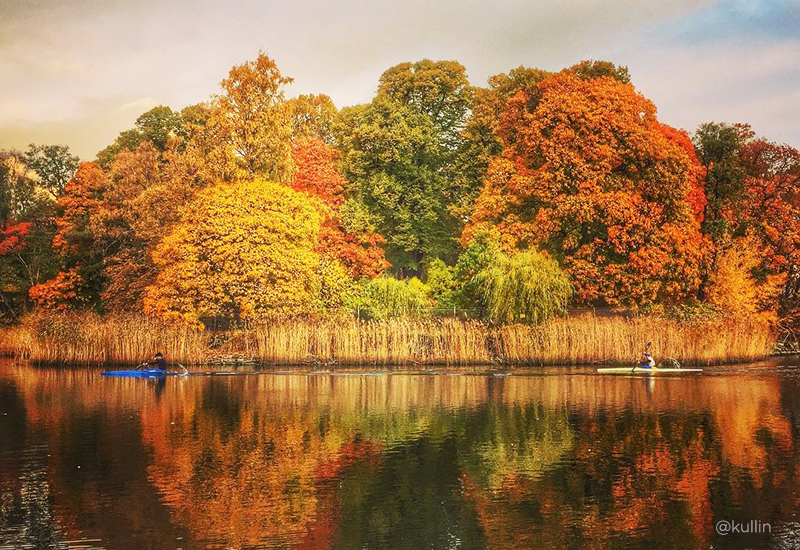 Haga Park is the world’s first national city park, located in Solna just north of Stockholm. This popular place is a vast recreational area with parks, water and gardens. It is also the home of the Swedish Crown Princess Victoria and her family who live in a house in the park. 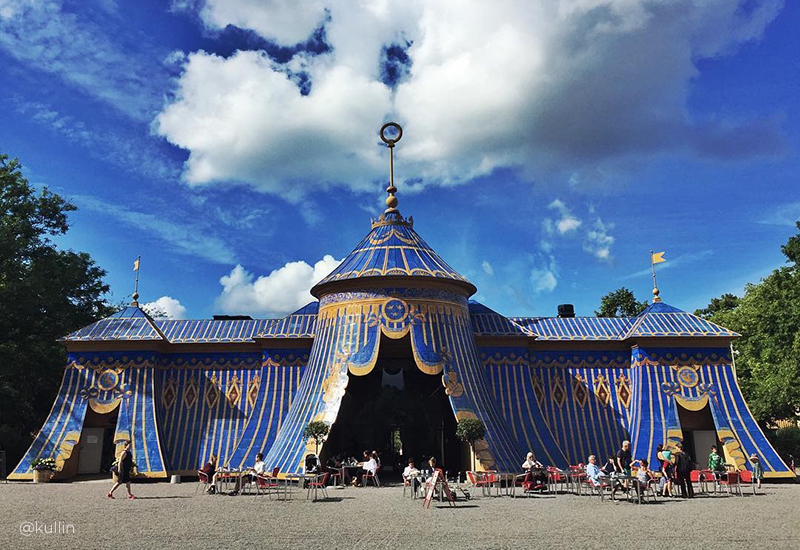 There are many different things to see and do in the Haga Park, like visiting the Butterfly House, see the Echo Temple or the peculiar Copper Tents as seen in the photo above. In the summer you can go swimming in lake Brunnsviken, or why not rent a kayak and expore the park from the lakeside. The park is full of old and majestic trees that turn into a colourful palette of green, orange, red and yellow in the fall. 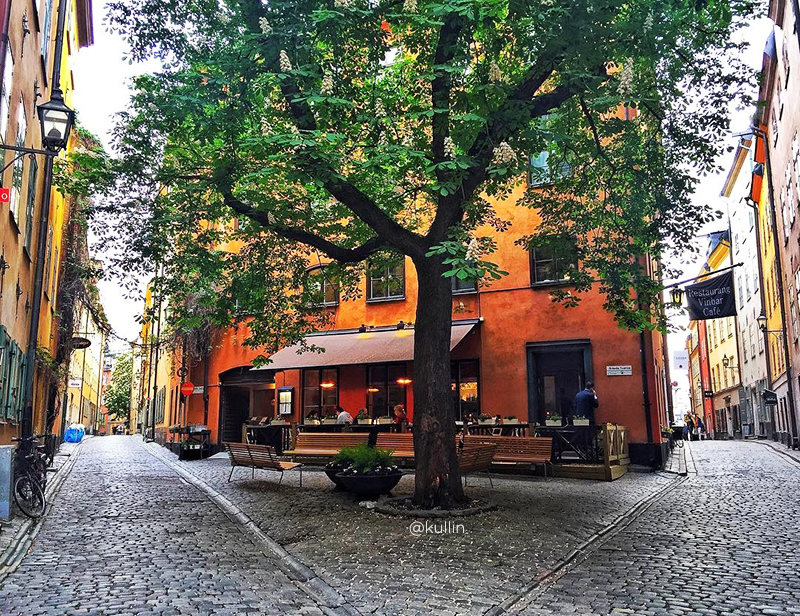 There are of course many other cool places in Stockholm to photograph. 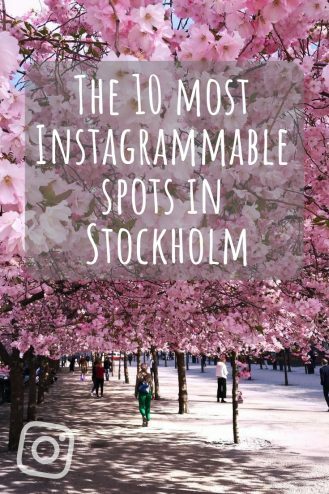 What are your best Instagram spots in Stockholm? 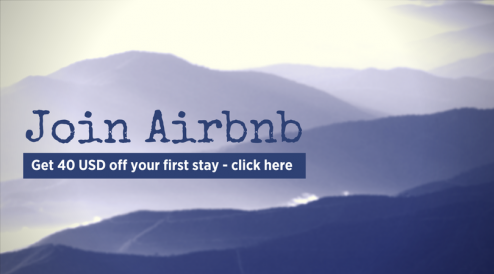 Add your tip in the comments.